Ofsted Inspection - Is your nanny ready? 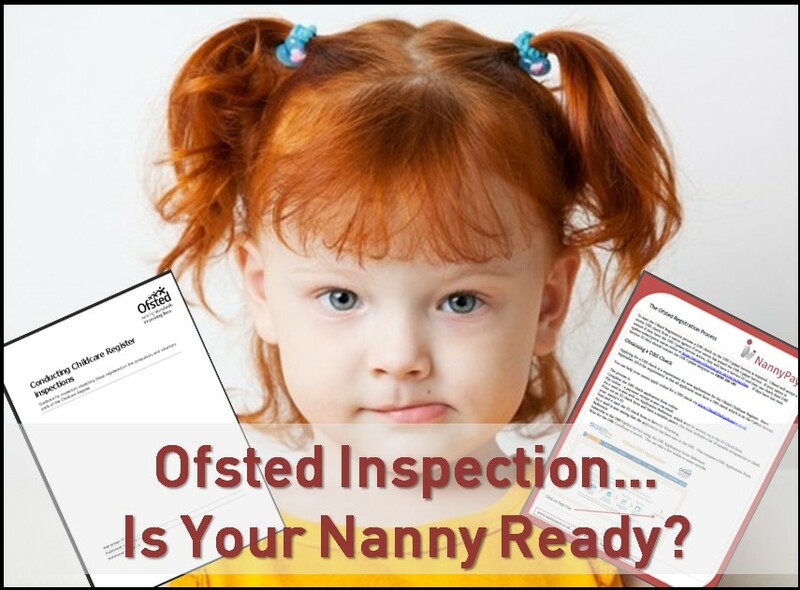 Blog Ofsted Inspection - Is your nanny ready? At NannyPaye we employ staff who have experience in the nanny industry and one of our staff members was inspected by Ofsted in December. We feel that it would be useful for many of our clients to know more about the Ofsted inspection of nannies (Home Childcarers) and for nannies themselves to know what happens at an inspection. Ofsted randomly inspects 10% of registered home childcarers in England each year so your nanny may get selected for an inspection or may be registered for many years and never have an inspection. The childcare inspector will call your nanny to arrange a suitable time for the inspection, which can take place at your home or at the nanny’s own home. There may be little notice given, typically a week and the date/time may not be that flexible, though the inspector should try to fit in with your nanny’s usual routine. The inspector is checking that your nanny meets the criteria for registration, they are not inspecting your home, though as inspections take place Monday to Friday during the day it can be more convenient to have the inspection at the workplace. The inspection takes around 30 minutes and involves the inspector looking at your nanny’s documents and asking them questions about their work and knowledge of child protection procedures. Do you ensure you keep children safe from harm and how would you do that? Do you ensure you are present on the premises at all times whilst children are present? Do you ensure you do not smoke, consume or be under the influence of drugs, medication or alcohol? Do you ensure children’s behaviour is managed in a suitable manner? Do you ensure you do not use corporal punishment? Do you ensure that older children do not have a negative effect on younger children? Do you ensure that the childcare is accessible and inclusive, taking reasonable steps to ensure each child’s needs are met? Do you ensure that the childcare is accessible and inclusive by not refusing to provide care due to race, religion or disability? Do you make your Ofsted certificate available for parents to see? Do you provide parents with the address of Ofsted should they require it? Do you inform Ofsted of changes to circumstances as soon as you can, no later than 14 days after the change? Would you inform Ofsted of a change to the address at which childcare is provided? Would you inform Ofsted of changes to the type of childcare provided (such as caring for children from more than one family)? Would you inform Ofsted of changes to your name, address, telephone number and any offences that may disqualify you from working with children? Childcare training / Common Core Skills & Knowledge. Are you familiar with child protection procedures and have you had any safeguarding training? What would raise a concern? If a child disclosed something to you, or there was an obvious injury, how would you feel about following the safeguarding children procedure? What if you thought it was the parents, or if the child said it was their parents – would this affect how you handled the situation? How long would it take before you took action? What action would you take? The inspector will give their decision and then a letter is sent to your nanny stating the outcome of their inspection. If there are any areas that require improvement, the inspector will write an action plan which describes what needs to be done and a date by which it must be completed. If your nanny does not comply with this then Ofsted may take steps to deregister them. If your nanny is selected for an inspection they are likely to be very nervous about what will happen. These inspections do frighten people but they do not take that long and do not involve asking questions which the nanny is unable to answer. We hope the questions above are of help to reassure you and your nanny that the Ofsted inspection is not to be feared but is just part of the procedure involved in being on the Voluntary Childcare Register. Brief guide to Nanny Ofsted Registration – an overview of the Ofsted registration process including cost, length of time to register and the use of childcare vouchers. Guide to DBS Check and Ofsted Registration – A walk-through guide to obtaining a DBS Check for your nanny and completing the Ofsted registration form (CR1).